Welcome to our Second Anniversary Post! For the inaugural post we looked at a novel way of living with Usher Syndrome in Sunsets for Kate. March 2018 brought the story of Kevin Hines, his remarkable survival, and other supports to help people cope in life. This time we focus on giving Indigenous girls a better today and tomorrow. Please check out their posts and others tagged with #WATWB. Back to our story as reported by Briana Shepherd from ABC News, Australia. Christal Quartermaine was 15 years old when her 13-year-old sister took her own life, just four days before her birthday. “You don’t ever get over losing someone in that sense,” Ms Quartermaine said. As the oldest of five girls, now four, Ms Quartermaine had little time to deal with her grief. “I did have to step up,” she said. Ms Quartermaine worked during the school holidays at a bank to help support her family. Little more than a year later she fell pregnant while in Year 11 at school. “The hardest part was still dealing with losing my sister and then, you know, you’re going to have a kid,” she said. As a student at Clontarf Aboriginal College, a Catholic school in Waterford in Perth’s south, Ms Quartermaine thought her academic life was over. But the college, along with her mother, were insistent she finish school. Ms Quartermaine said had it not been for the support of her school and in particular the Girls Academy — a not-for-profit charitable organisation that places mentors and role models at schools — she did not think she would have made it through. The Girls Academy was founded by a former basketballer. Indigenous or Torres Strait Islander women feature in the organisation. They are not just the helped people, they are the majority of the staff. The Girls Academy program was founded in 2004 by Olympian and champion basketballer Ricky Grace (MEdL, BPoLSc) and works within the school system to drive community-led solutions aimed at overcoming the obstacles that prevent Aboriginal and Torres Strait Islander girls from attending and achieving at school. Academy Girls receive intensive one-on-one mentoring and support from our team of skilled field staff, 80% of which are highly accomplished Indigenous women. Christal Quartermain’s story is a poignant one. It is delightful to see how such an academy can help her find a path for her life. You can look up The Girls Academy on LinkedIn, follow them on Facebook and tweet them on Twitter. They share images on Instagram. 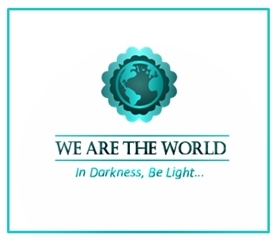 We love bringing you the We Are the World Blogfest #WATWB of good news on the last Friday of each month. Please join our anniversary celebrations by reading and sharing other posts. Thanks so much! What a great story, Simon, and so inspiring. I am also sharing an Indigenous story this month. Congratulations on the second anniversary of #WATWB – two years of bringing good news to the world. That has to mean something. What a wonderful story. The Girls Academy is a great example of what kind of difference available resources can make in helping people make profound shifts in their life trajectory. So much to celebrate here with this story, and so many good things to celebrate in the two years of #WATWB. Yes, thanks Deborah. There’s so much to celebrate here. I love that journalists are now seeking such stories. May there be more of it. Thanks, Norah. I must look out for your post too! Can’t believe it’s another anniversary. I wish #WATWB many more years of sharing positive news stories. Thanks, Marja. Lovely of you to visit. Peace to you across the Tasman. What a great post! ♥ Thank you so much for sharing this story and for being an integral part of #WATWB. We’ve been going strong for two years thanks to you and the rest of our #WATWB family! Happy Anniversary! Thanks, Belinda. I love #WATWB, as you know. So glad we have got this far. You are a great leader for us with Damyanti. This is an awesome story of triumph for Christal and reflection of what a solid faith community can provide in resources. I applaud them for their determination, efforts and kindness. Thanks for sharing, Simon, and happy two-year #WATWB anniversary! Yes, Mary. It is a great reflection on such a faith community (that makes me smile). Happy anniversary to you too, Mary. Thanks so much for visiting, Anou. May Project Why continue to give life. You’ve picked up on the threads very well, Hilary. It’s so good that such things are happening, as some of our history with our indigenous brothers and sisters is terrible. I hope The Girls Academy Continues to thrive. Thanks for your faithful visits and comments to me and to #WATWB. Lovely post Simon thank you! All kudos to Ricky Grace and The Girls Academy – their success rate speaks for itself. Thank you, Susan. It is good. Hope all well with you.